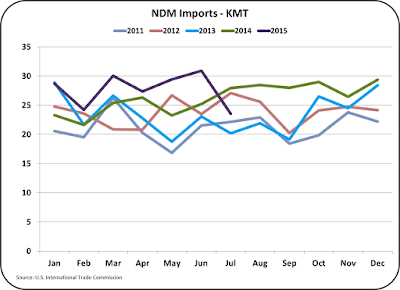 Class and Component prices for August were announced on September 2, 2015. 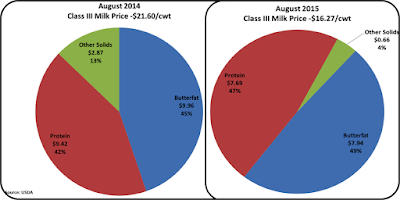 The Class III price was down only slightly, moving from $16.33/cwt. 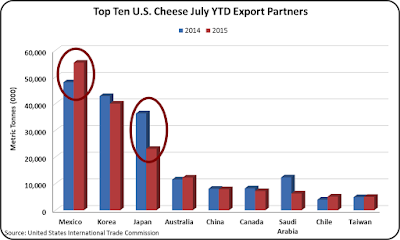 in July to $16.27/cwt. in August. Both cheese and butter prices improved in August with butter reaching $2.04/lb. 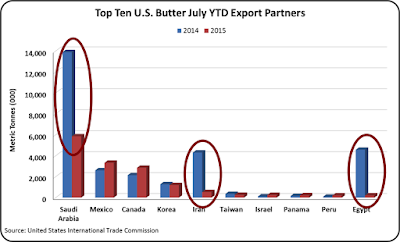 More details on butter are discussed below. 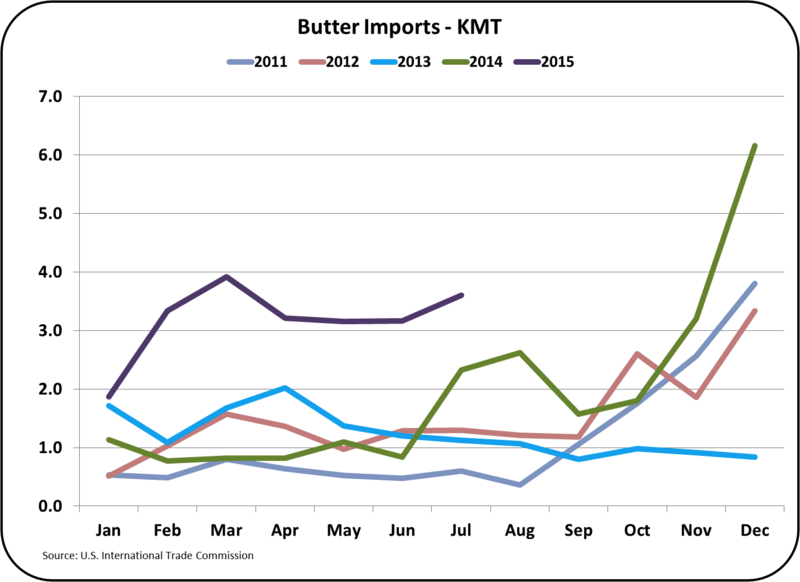 With the increase in butter prices, milk butterfat gained 7.3%. 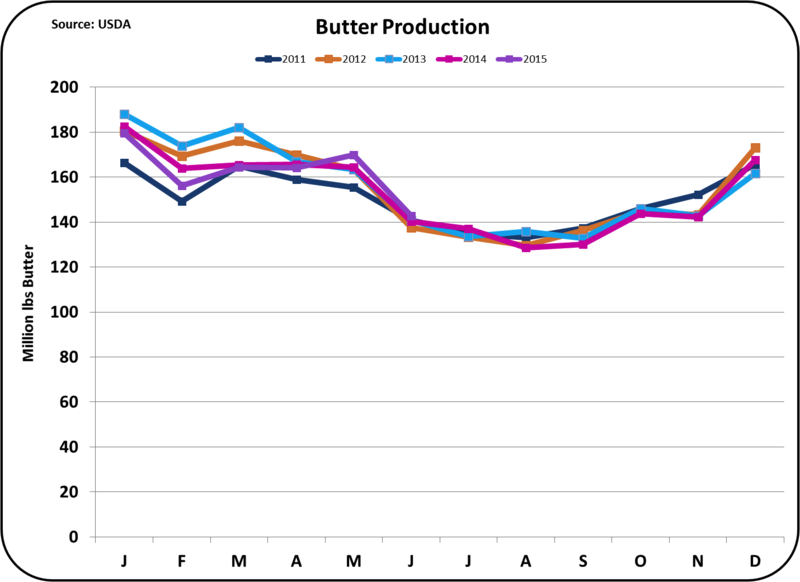 However, also due to the increase in butter prices, milk protein dropped slightly. More details on this are also discussed below. 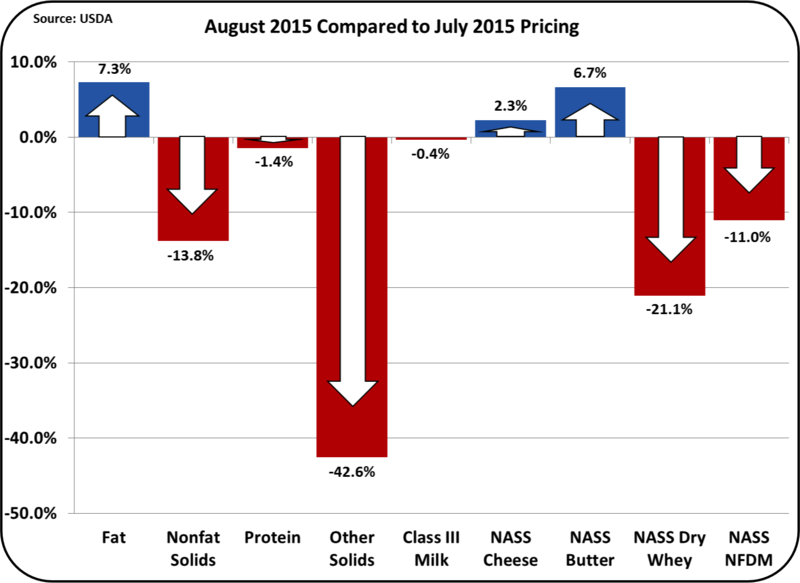 The biggest loss was in dry whey prices which fell to $.31/lb. in August from a high of $.69/lb. one year ago. Dry whey pricing is the basis for valuing "Other Solids" in the component payment system. Therefore, "Other Solids" fell from $.50/lb. one year ago to $.12/lb. 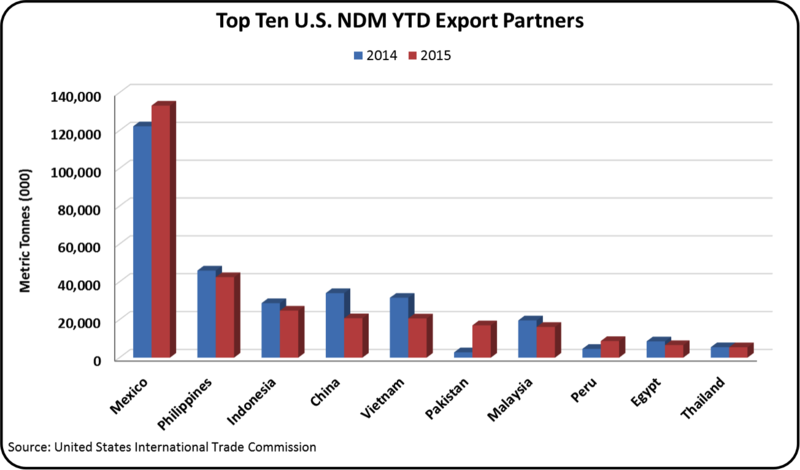 for August 2015. The impact on the Class III price is shown below. "Other Solids" contributed $2.87/cwt. to the Class III price one year ago. 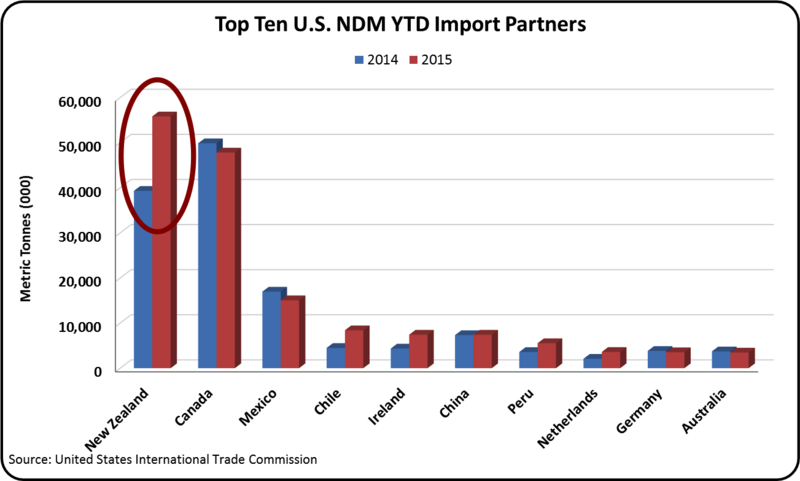 In August 2015, "Other Solids" contributed only $.66/cwt. in 2014 "Other Solids" made up 11% of the milk check, and in 2015, it made up only 6% of the milk check. Dry whey is primarily an export product and is strongly influenced by international events as discussed in a recent post to this blog. 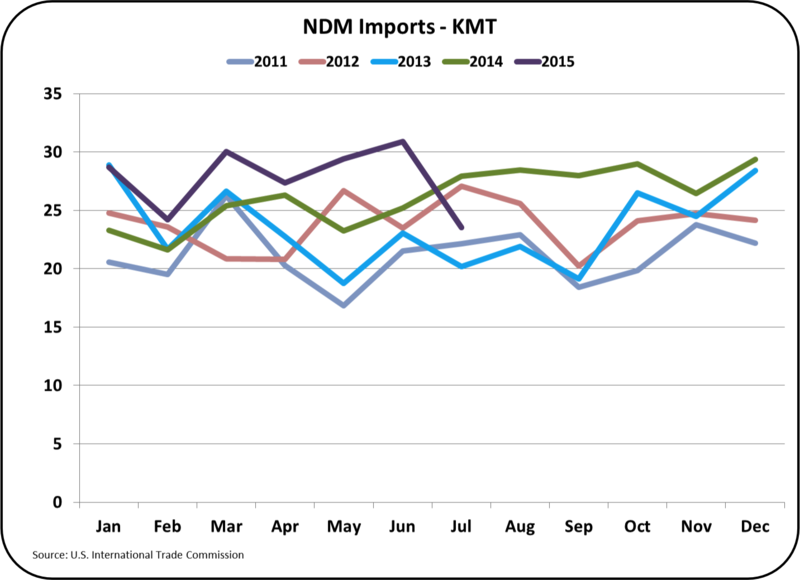 As shown below in the long-term component price trends, the most significant mover is "Other Solids." 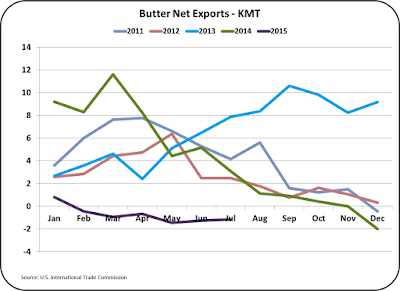 Butterfat continues to express its new higher value which is somewhere in excess of $2/lb. 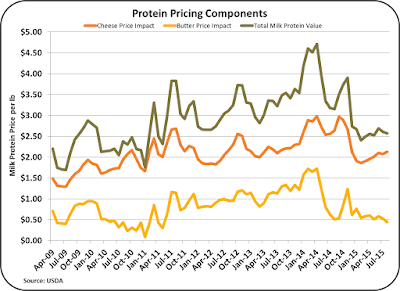 Milk protein is being held below its long term trend because of the higher butter price. 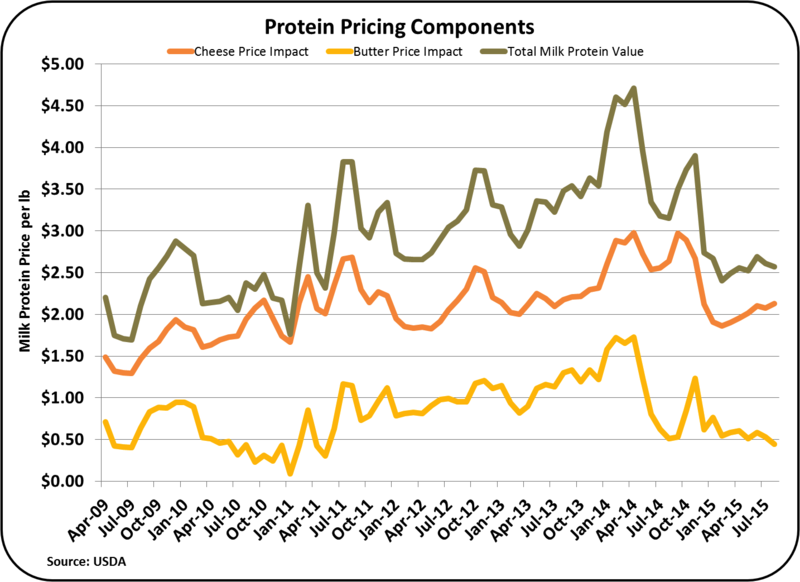 The price of milk protein is influenced by the price of cheese and butter. 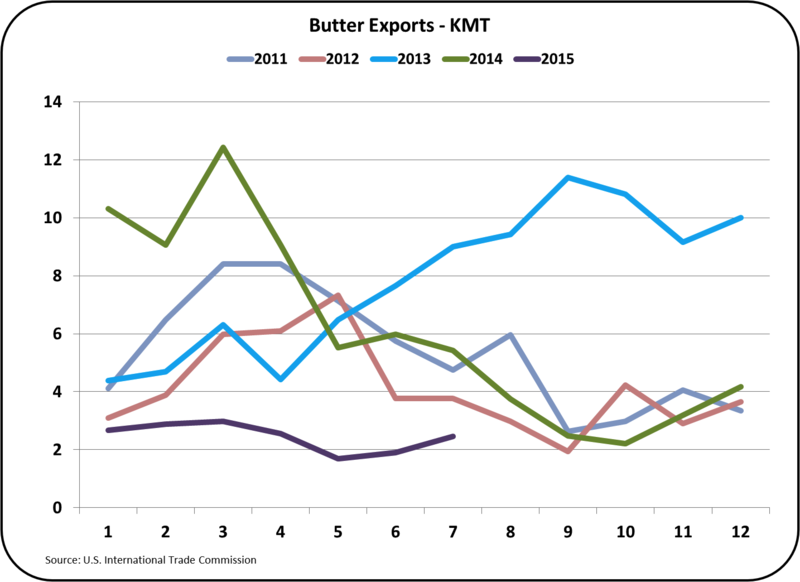 Butter comes into play to give value to milk protein because butterfat is more valuable when used in cheese than in butter. 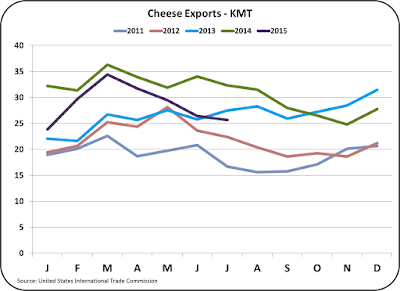 Cheese cannot be made without milk protein, so milk protein gets "extra" value when it can sell butterfat at a higher price in cheese than in butter. 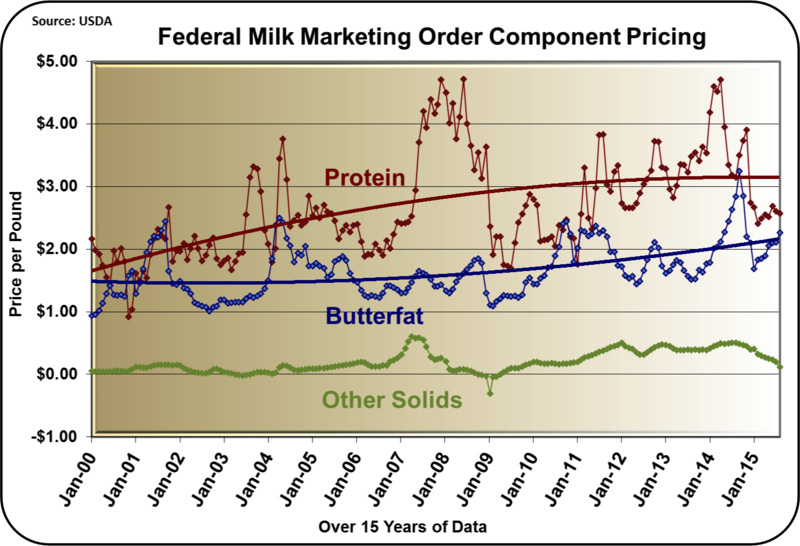 Expressed graphically, the two components of the formula contribute to the price of milk protein are shown below. 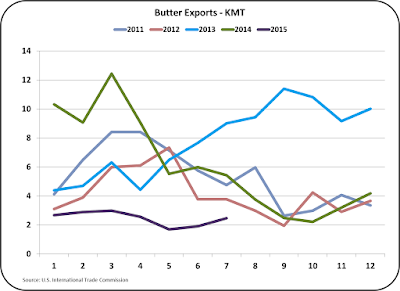 Because butter is currently selling for an excellent price, and cheese is selling for a moderate price, the contribution from the butterfat factor is low and going lower. 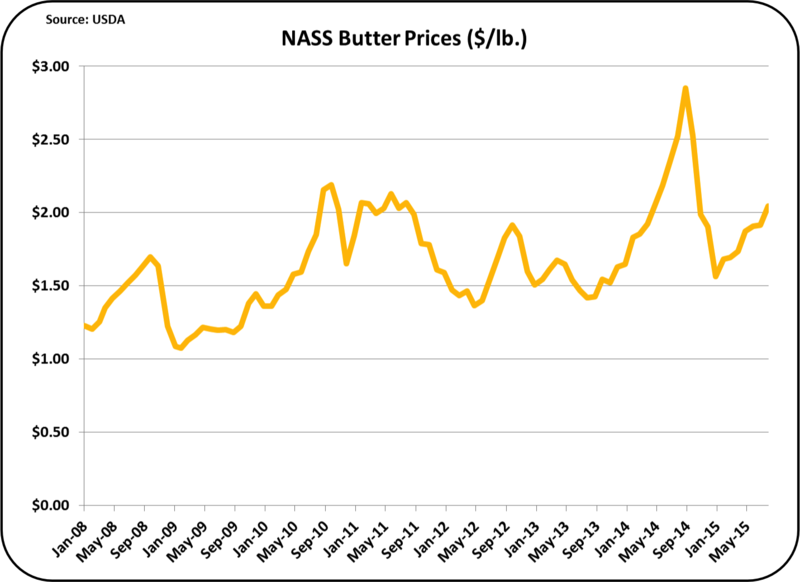 Butter pricing is showing a positive trend over the last seven years as shown graphically below. 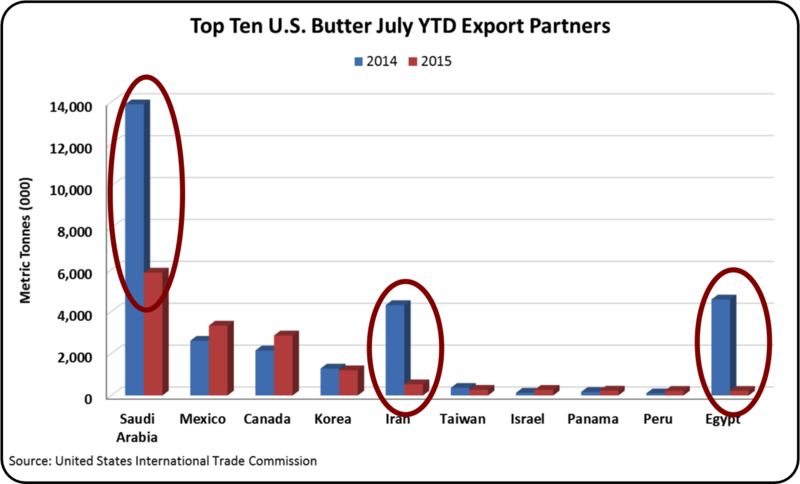 However, with lower priced butter being imported, it’s doubtful that this trend will continue. 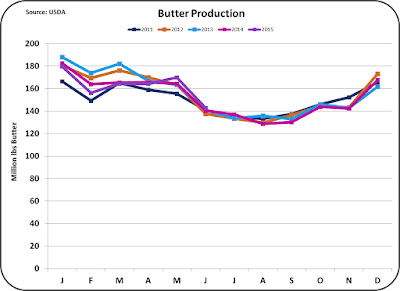 Butter production is being managed to remain at almost identical levels to prior years. 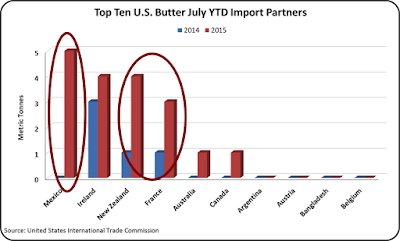 Because very little butter is being exported, the prices above really do reflect the domestic value of butter. 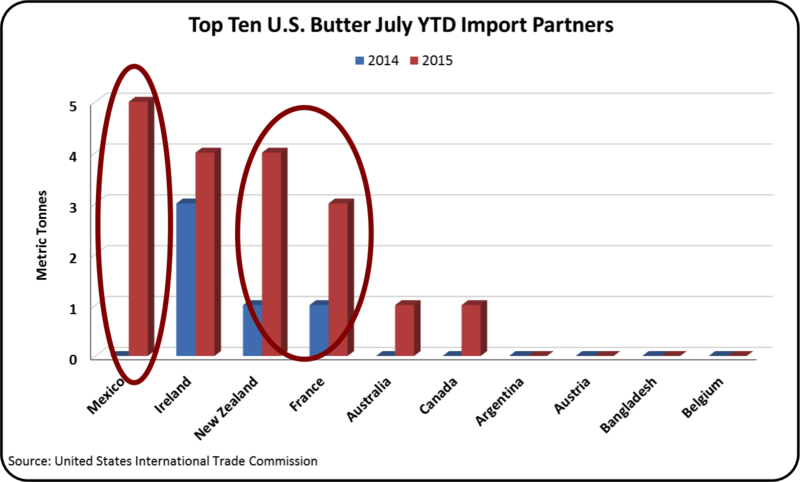 Record setting levels of lower priced butter have made the U.S. a net importer of butter. See the August 15, 2016 post for more details on this. 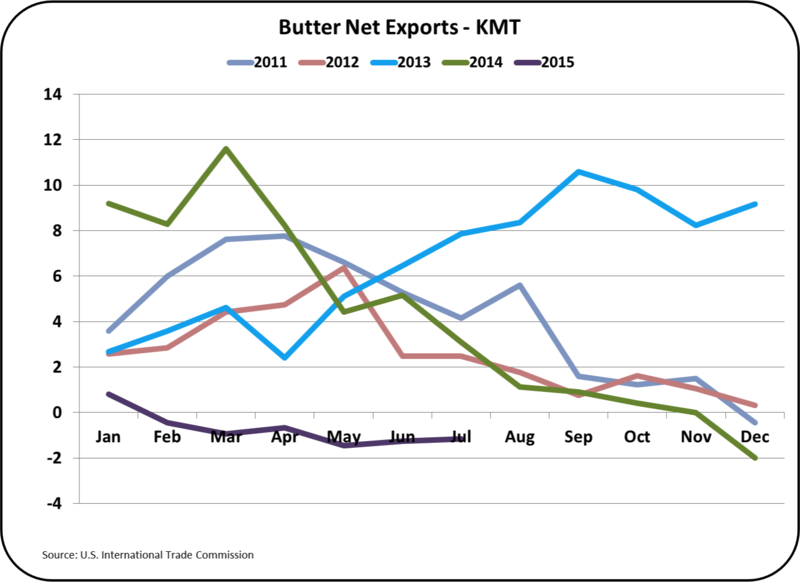 Butter futures are showing a significant decline beginning is December 2015. 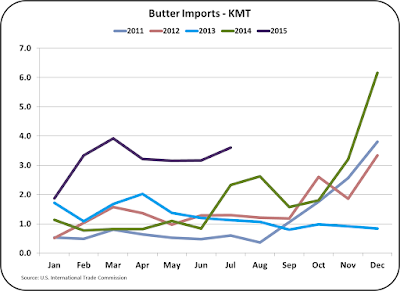 Butter prices are expected to fall from the area of $2/lb. to around $1.80/lb. 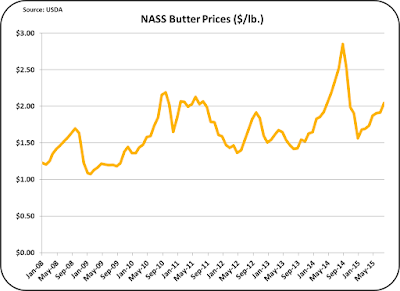 The change in the price of butter has little impact on the ClassIII price. 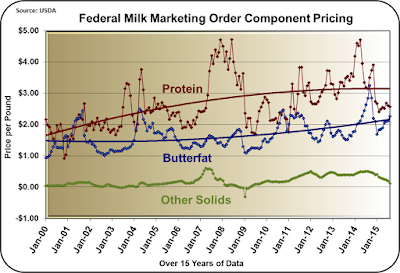 It only shifts the milk protein and butterfat prices back and forth. As one goes up, the other goes down. 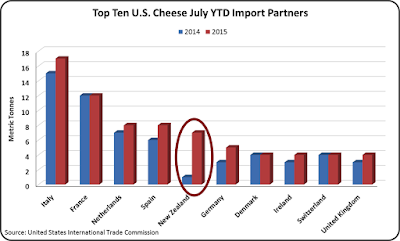 The most important element to watch is the price of cheese. 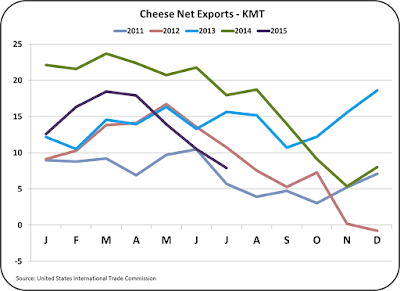 In the last post, rising cheese inventories were analyzed and there was reason to be concerned that they would decrease cheese prices. 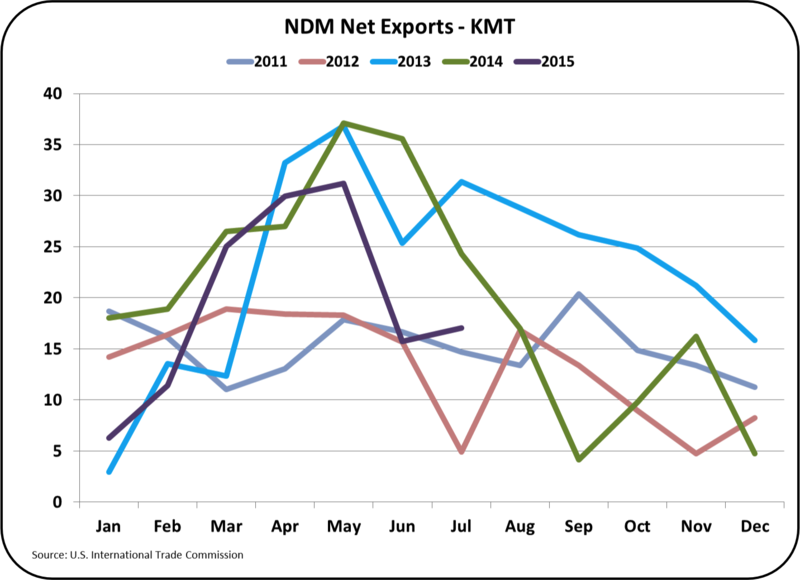 However, none of this concern is currently being reflected in the futures market. 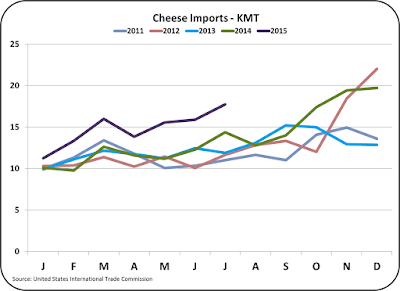 Cheese is expected to maintain it's current value. 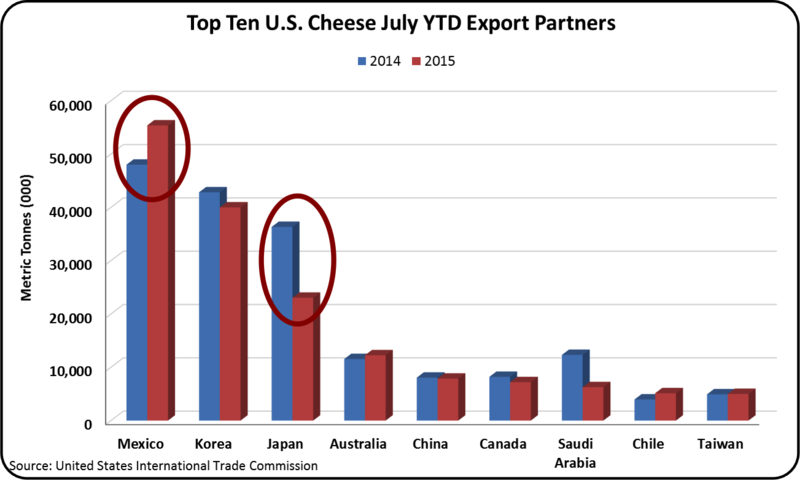 As long as that happens, the Class III milk price will remain in the same $16/cwt. range. 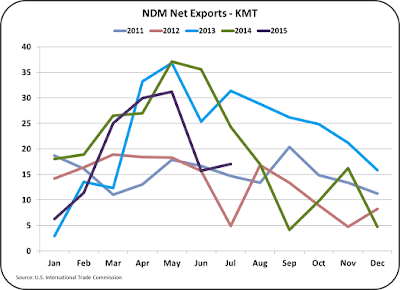 Imports and exports are significantly influenced by the international markets. Other countries can make the same dairy products and if they are less expensive, they will influence U.S. imports and exports. 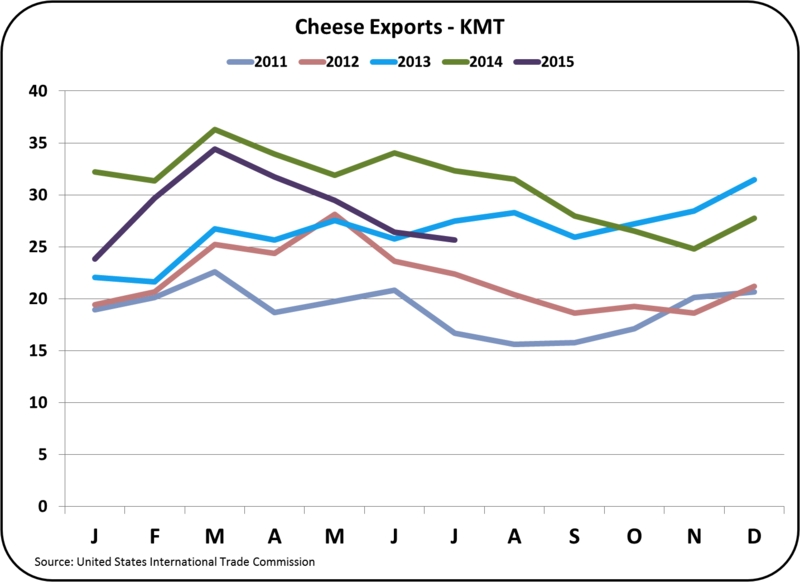 As imports and exports fluctuate, they influence domestic inventories of dairy products, which in turn influence domestic dairy prices. 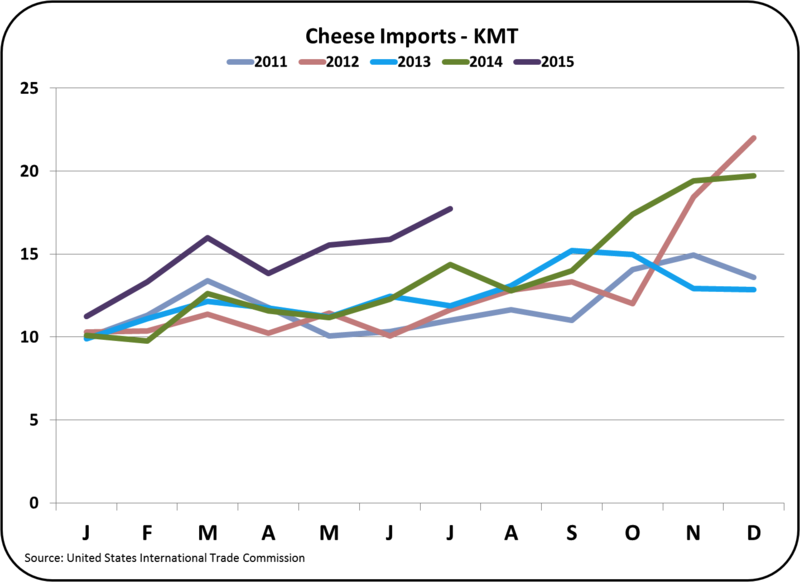 The most important dairy product to watch is cheese, as its price has a very significant influence on the Class III milk price. 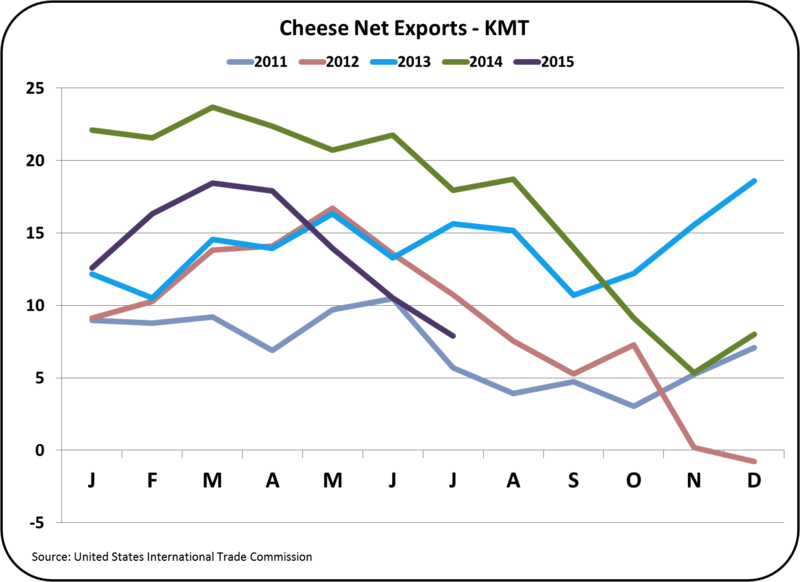 Dairy is now an international business and the entire dairy industry will have to learn how to manage with this international influence. The U.S. dairy industry cannot go back to being only a domestic market.